This recipe was originally featured in Lemon Tree, Very Pretty in our Mostly Plants series. Summer-Thyme Lemonade made in the Adventure Kitchen. 2. Make thyme simple syrup: Put the sugar in a medium saucepan. Add thyme and 3/4 cups cold water, stirring to combine. Heat the mixture over medium-low, stirring occasionally, until the sugar has melted, then remove from heat. 4. Squeeze the juice from the lemons to make 1 cup. Depending on the size of your lemons, you may not need all of them. 5. Remove the skin from the peach (if it's ripe, it may slip right off), and cut the peach into chunks. Add the chunks to the pitcher and use a potato masher or fork to mash them into a liquidy pulp. Add the lemon juice, 3/4 cup of the simple syurp, 2 quarts of cold water and a very small pinch of salt. Stir to combine. 7. 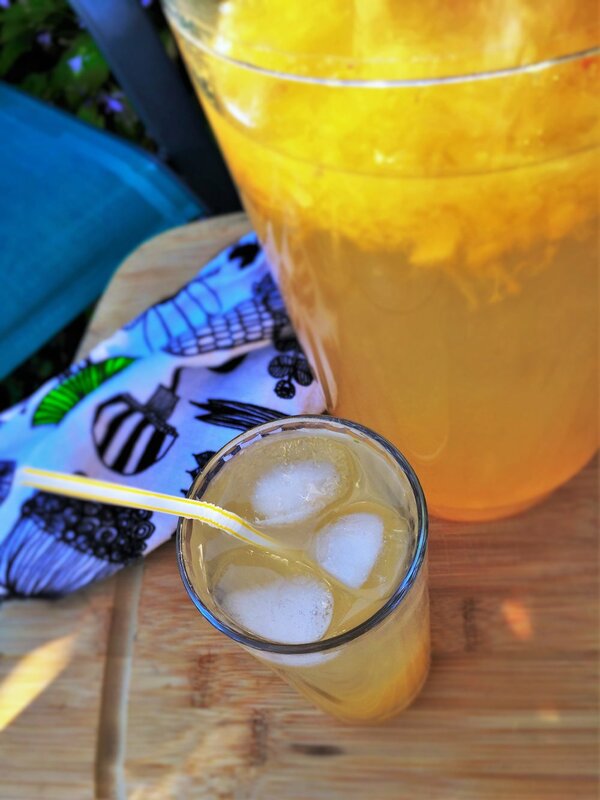 When serving, add the ice to the glasses rather than the pitcher so the ice doesn't dilute the lemonade as it sits. You can make the thyme simple syrup ahead of time and store it covered in the refrigerator for several days. You can also freeze it in a covered container for months. To prep several pitchers ahead of time for a party, combine several batches of lemon juice, thyme syrup and mashed peaches in covered containers - each container holding enough for one pitcher. Then at party time, simply pour the contents of each container into a pitcher and fill with water. Give it a quick taste and add more syrup if needed, and you're ready to go.